Be the first to hear about their new releases and deals. Download the Booksprout app and search for Mark Playne today! After film school, I turned down a dream job. A commission writing a thriller for a TV serial. I gave my self the excuse that I was too young to write about such characters. The reality was that I’d dreamt that I’d waken up on my fortieth having realised I’d spent my life behind a typewriter. The sensation of feeling that my youth had been spent conjuring up fictional characters in fictional adventures instead of having my own, was jet fuel for my itchy feet. Instead of settling down and getting a nice car and mortgage, I hit the road. Bouncing around the worlds five continents I explored over fifty countries. I paid my way as a street trader selling hand made jewellery working. This then grew into working at Europe’s and Australia’s music festivals. The real-life adventures came thick and fast – and time flew by. I woke up on my fortieth birthday feeling battered and bruised. Nothing seemed more appealing than a quiet life behind a typewriter and I set about reentering the world of storytelling. I set out to make a film that travelled as far as I had. My debut short film ‘Love at First Sight’ excelled these ambitions and enjoyed 200 selections at films festivals across all the continents, reaching 50 countries and won 76 awards. 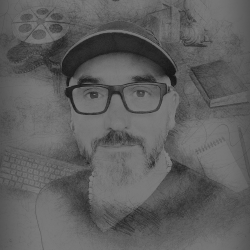 I have now served on the jury of film festivals in the United Kingdom, France and Hollywood and I'm a member of the WGGB (Writers Guild of Great Britain) and Directors UK. The novella '3 Seconds in Bogota' is my debut into the world of books. This will be shortly followed by my first novel which I am converting from a screenplay, based on child adventure story based in Morocco – called ‘MoMo'. I divide my spare time between an old ruined farmhouse in Spain and keeping an old WW2 air-sea rescue launch on the banks of the Thames in London afloat - both never-ending DIY projects. When not trying to resurrect old beasts, I hide in a jungle beach hut in India where I write. I enjoy hearing from people who've seen or read my work, so please do get in touch.